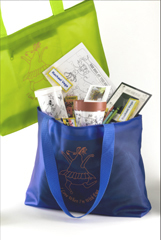 Currently Out of Stock This beautiful Rachael Vega ® Tote comes in Blue or Green and is fulled with Rachael Vega ® Coloring Puzzle, Coloring Frame, Coloring Pencil Cup Holder and Coloring Planter with seeds. All come with crayons. This is a great gift for anytime.